I take back all those unflattering things I've said in the past about Bilbao. That stuff about how it's the "the Pittsburgh of Spain." Yes, it's an iron city. Yes, the Ría that runs through it is brown. And yes, it's annoying, if not panic-inducing, that the Guggenheim Bilbao is now listed in 1000 Places to See Before You Die. 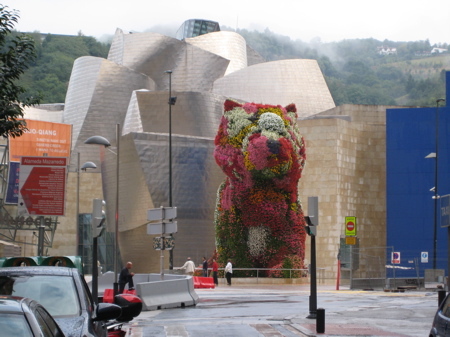 But the city that inspired a planning cliché, "the Bilbao effect" (build a Big-Name-Architect museum and you'll soon be polishing up your rusting economy with wads of tourist dollars), is more than all that. A month ago, we set out on the Camino de Santiago from here. 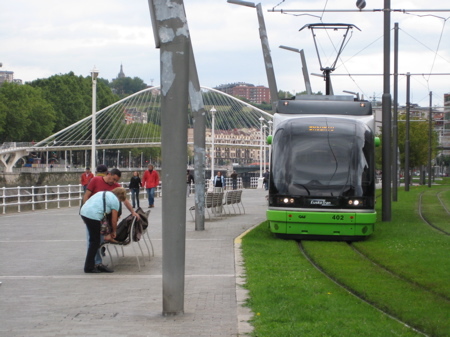 There are historical arguments for starting in Bilbao – the city has figured on Camino trail maps since the 1300s – but I chose it for practical reasons: You can get to Bilbao from just about anywhere. And yes, there’s Gehry’s museum. Its green, green heart. You fly into Bilbao over rounded hills. “It’s like a fairytale,” said Ed, looking out the window at forests, meadows, and farmhouses coming into view through a mist. The Guggenheim is famously sited up against the city’s industrial edge, but here’s what nobody tells you: it looks pretty swell against that green farmland too. Its good, good eats. The market has a whole floor, icy and sweet-smelling, dedicated to fish. An encouraging first stop. 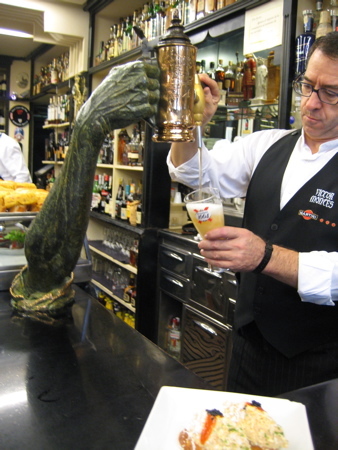 Afterwards, my Bilbaina colleague, Carmen, pointed us to her favorite bar on the Plaza Nueva for a pintxo (peppers and tuna and cod and countless other little bar bites) and a zurito (a little beer). The tap is a bronze hand by Lorenzo Quinn. And the fluffy scrambled eggs they fed us as a vehicle for buttery sautéed cèpes, well those cured our jet-lag, I swear. Big colorful windows. It rained a few times on our first day here. Then again, the sun came out a few times, too. The Basques track it all from their pretty enclosed balconies, sometimes painted bright colors. The Euskotran. The walks from old city to new couldn’t be better: fifteen minutes along pretty 19th century boulevards and grandly gardened roundabouts or an equally easy stroll via the promenade along the river (and you get to cross Calatrava’s glass bridge). But it’s just so sweet the way this little tram zips quietly along the grass. Bilbao’s big girl. You gotta love her. And also the shop selling boinas, those huge rain-worthy Basque berets. And the windows full of hiking gear including stuff for the people who are into ropes. Bilbao is just that kind of hearty, practical place. Ongi etorri! Actually, nobody welcomed us with this greeting when we touched down in Euskal Herria (that’s the Basque Country, to you). 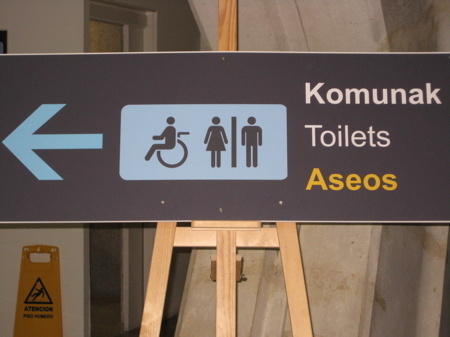 But, with our comfort in mind, the airport did offer this helpful invitation to the komunak. Just the fact that the Basques have Euskara, their very own language that no one else can figure out, makes me want to write them a love letter in lemon juice. In all, the plan was to land in Bilbao and get on the Camino without looking back. But that’s not the way it went. For one thing, there was that last lunch at another of Carmen's favorite places, a restaurant whose name I cannot bring myself to reveal (except to my clients): beautiful ham, and a “Rioja with Ribera tendencies” (my god, what was that? ), a luscious stew of garbanzos with lobster, tiny squid with slow-cooked onions, a delicate shell of a cream puff, coffee on the terrace overlooking the city. 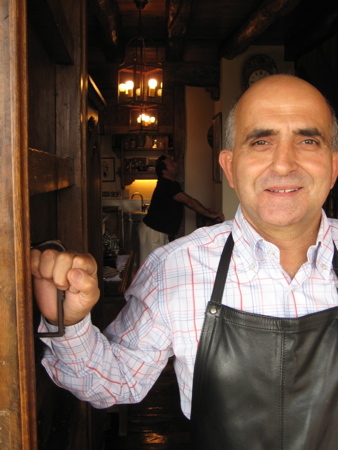 As I was leaving, the gracious owner-maitre, Patricio Valiño, discreetly handed me something. “Oh madam, I believe you dropped this…” It was the button from my pants which had, it seems, miraculously shrunk during our Camino journey. The Euskotran is cute, but my favorite thing about Bilbao was the buses, which all have the big logotype BILBOBUS on them. 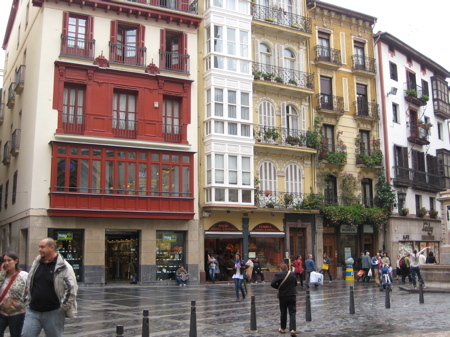 Why don't we call this city "Bilbo" like the Basques do?